Situé dans le quartier historique Vallecito, Californie, Sierra Or pays sur 217 hectares privées mis de côté comme un santuary pour les personnes et les animaux. Cette maison loin de la maison est meublée pour votre confort et plaisir. Profitez de la vue de fleurs et de la faune amoungst crêtes de montagne, tout en vous relaxant sur le porche. Vous recherchez la sérénité, randonnées dans la nature, d'aventure, visites touristiques, de la pêche et des activités amusantes? Si oui, ce est l'endroit pour vous! Il accueille un lac poissonneux, cours d'eau saisonniers, des sentiers pédestres, allant de taches de méditation facile à des randonnées plus difficiles. Un délice pour les photographes, ornithologues, chiens de roche et amoureux de la nature qui veulent se éloigner de la vie active et se détendre. Situé en face de Mimi Cavern, dans les 15 minutes de l'Etat-Britannique Park, Ironstone Vineyards et 24 salles de dégustation, des cavernes, reserviors, montagnes, villes minières d'or, des antiquaires supplémentaires. En hiver, le ski alpin et le ski de fond sont à moins de 30 minutes en voiture; en été, le canotage et le ski nautique sont fabuleux à New Melones Lake. Il ya de nombreux établissements de restauration décontractés et fine, shopping, concerts, pièces de théâtre, pêche, rafting, prospection d'or et bien plus encore. Il ya beaucoup d'événements réguliers, le premier vendredi de Décembre, l'adhésion à des résidents de Murphys à l'ancienne manière parade de Noël et la maison ouverte sur la rue Main à 17 heures. Le comté de Calaveras équitable et Frog Jump est le 3ème week-end de mai, et l'Octoberfest et de raisin Stomp ont lieu en Octobre. Nous avons aussi une rue de fête foraine et un défilé pour Murphys Jours irlandais en Mars, ainsi que de nombreux autres événements réguliers. Peaceful and quiet. Great views of typical California foothills. Lovely. No cable. Cottage is roomy, clean, well appointed. right from the start where we were greeted with fresh baked cookies to a neat cabin to stay in. All the rooms were neat and tidy with fresh linens. The Restroom was clean and hygenic with ventilation. Bit old style cabin but a perfect retreat spot for quiet weekend. Ktichen had all adequate stuff for us to cook for and near by you have places to buy essentail stuff. the surrounding is beautiful with great landscape forcing you to sit out on nice evning and having a fun time with the group. The only downside i felt it was a little old style , may be a bigger television with more variety of DVDs and board games could have added more stars to this near perfect place. But again if your a are group of 4 looking for a quiet retreat a perfect place !!! Beautiful Picturesque Property! I would stay again and again! This was a perfect place for our group of 4 adults, she has bigger units if you inquire. As the ad said it is on 200+ acres of beautiful serenity filled property and it is not exaggerating in the least. If you stay at the Radisson or the Hilton keep looking, you probably won't like it, this is down home staying with grandma except grandma won't ask you awkward questions or pinch your cheeks but she just may leave you delicious fresh baked cookies. Only Hotel that provides cookies I know of is Country Inn & Suites and these cookies were twice as good Mmmmmmmm! Sincerely was a little dated and country but that didn't stop the beautiful experience we felt on this property! I prayed for God to show me that an idea with a home & 4 cabins that could feed and help the homeless could work and then I stayed here. It has exactly 4 cabins and a home for the owner. I am now pursuing finding my own property to build my 4 cabins and a home. Please pray with my family for us to achieve this. This idea is bigger than just cabins, I believe any one who follows God can be more effective with their money beyond tithing. Take staying at a place that donates say every day over 100 ( 100 days paid the owner) and 200+ days of its rental went to charity, imagine how many people it could feed! Or if say a tshirt company said I need 1000 shirts printed and every shirt over 1000 went to charity! As a fellow Christian or anyone wanting to do more with there dollars wouldn't you want to stay there or order the shirts, have your addition built etc if the owner pledged to donate everything over what they needed. I would like to start an Org like this and include owners who do more with their dollars. We would help owners out with the advertising, photos and updates if needed after all who's got time to learn social media when they are feeding orphans in Africa! Contact me through the owner if you would like to do more. Thank you and God Bless! We had a very nice stay at this cottage, though found it quite difficult to get any of the windows to open (or stay open) and the weather was hot so we needed the air. About two weeks after we returned, I contacted the manager to inquire when we would receive the return of our $250 deposit as I had heard nothing from her. She responded that a window was broken and she would not return our funds until it was repaired. We did receive part of our deposit a week later; however, we did not break a window. Frankly, the windows in the house are so old that any one could break with just the normal force necessary to open one. I wish the manager could recognize that the windows need replacing just as part of upkeep. For this reason, we will not stay here again. It is impossible to please everyone no matter how hard we try. Our desire is for our guests to enjoy their stay and have a wonderful experience by providing homes are safe, clean and comfortable. Vanessa did not stay in Serenity Haven as it was rented & not available so we upgraded them to our Glory Manor, a 3 BR. & 2 bath with a big discount. I am glad Vanessa and her guests did enjoy their stay and sorry that she doesn't see the truth. When everything is in good order and nothing broken when they are welcomed and given a key and they and their guests are the only people to enter the house and a double pane window is broken on the inside pane there is no question that one of the guests is responsible. There were 4 adults and 2 children and who did it and it would be nice if the person who broke the window would admit it. A chunk of glass was missing so the person who broke it had to be aware of it. A picture of the broken window with a piece of glass missing, a statement from the people who repaired it and a letter of explanation was sent the day the window was repaired along with the refund check. We legally could have kept the whole deposit but shared the cost of repair. This party brought more people than when booked and we did not charge the extra per night for over 4 people. When we entered the house after the guests departed the house smelled like smoke. Like someone started a fire without opening the damper. There was soot in the fire place where an electric heater was and a smoke smell that had to be eliminated. The drapes and draw string was messed with and furniture was moved and not returned to its original place so that was also extra work for the cleaning person. There are 14 windows that open in the house and 4 picture windows. Of the 14 windows 10 of them slide sideways & 4 slide up and down so I don't understand why it was hard to open or keep them open! Normally full refunds are issued and sent a few days after the guests depart and an inspection reveals there is nothing missing or broken. We love serving our guests and continue to strive to make their stay with us one that they will always remember with fondness and joy. We had a great stay. The grounds were incredible, and the friendly horse and turkeys were enjoyed by the whole family. We stayed here with 4 adults and 2 kids. A little cramped in one of the rooms when the trundle was pulled out, but we knew what to expect. 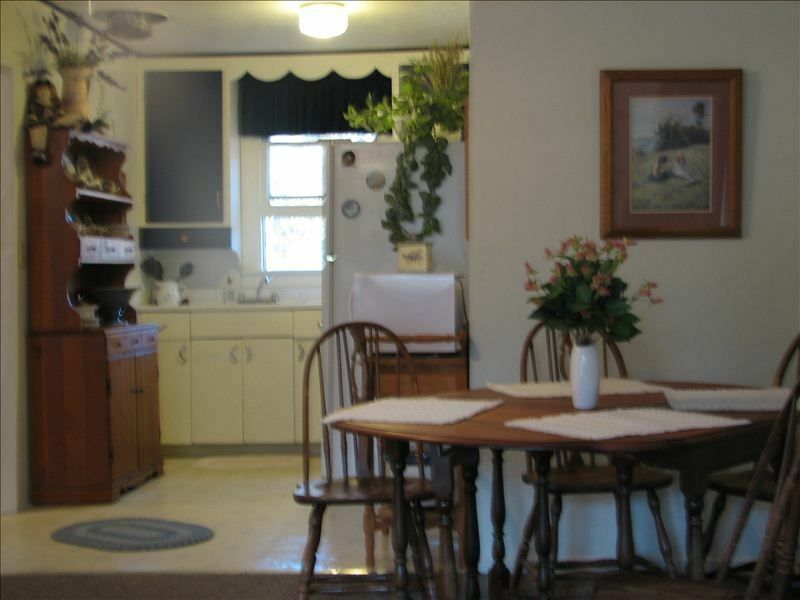 First the negatives....the actual house is a bit dated (general wear and the art on the walls is a bit faded). And the place is also used for Christian retreat activities, so if signs of this in the art, the movies, etc. offend you, keep that in mind. And that's about it. Margaret, who runs the houses was wonderful and very accommodating. And she got us set up and didn't bother us again....but she is on the grounds and available by phone, so I suspect if we had any issues, she would have been there if we need her (based mostly on my dealings with her getting this set up). The accommodations have everything you need, and for the price, made for an incredible stay for my extended family. Was very relaxing, clean, movies and DVD player and a few books, a few games, room in the living area to feel comfortable.....was just perfect. Location is not right in anything, but close to what we wanted to be close to, mainly Angel's Camp, the Moaning Caverns and Murphy's. Easy drive to everywhere we needed to go. Everything you want in a get-away type vacation rental. Also the cookies waiting for us was a really nice touch. Just the right balance of hospitality and staying out of our hair. Thank you so much for your response and we are so happy you had a great stay and enjoyed your time with us. This is an older home and it is part of it's charm. Not sure which picture or art work was deemed faded, however, the pictures are mostly airy pastels to add to a relaxing atmosphere. We have around 200 movies which can be checked out and there is a wide range with something for just about everyone. They are all suitable for family viewing. There are movies for children, horse lovers, romance, animals, war, sports, adventure, etc. We are a international ministry, however, the Vacation Rentals are separate from the ministry and the income is used to support our ministry whereby we feed orphans, help the homeless and those in need. They also help with the upkeep and to maintain the grounds. The guest are not expected to participate in any of our events unless they choose to. The property here is also available for different events like weddings, baptisms, small retreats, etc. Thank you again for choosing our place for your getaway and sharing your comments with us. You have a lovely family. I enjoyed meeting all of you and it was a pleasure to chat with you. Star, our horse enjoyed your company also and we all look forward to seeing you again sometime. Sur la route de Mimi Cavern et environ 3 miles de Natural Bridges. A quelques minutes de plusieurs attractions, notamment Columbia State Park (une charmante ville minière d'or que l'Etat a conservé) Plusieurs vignobles à proximité une cuisine raffinée et restaurants fast-food. Musées à proximité, vivent théâtre et bien d'autres activités, notamment l'orpaillage, golf, l'eau et le ski avec le vélo, la randonnée, etc.